hoom wrote: But as long as they're following the rules just passing through it can't be stopped. no they cannot any of points interpretation (surveillance , propaganda, sovereignty) gives right to not let them. It is only about will of Russians. What about US ships and freedom of navigation ? I though that the Sea of Azov is an inland sea administered jointly by Ukraine and Russia with no international waterway or right of passage without both parties consent, which is rarely withheld. And german ships are an exeption ? Ukraine could invite US ships if they really want to send nati ships there. Russia will block the strait with a big bulk ship/tanker like the last time. They said that USN & other outsiders has nothing to do in the Black Sea; much less in the Azov. They can also declare naval exercises there & close the area at any hint of ships approaching. Or they can let them in but not out, closing the trap. After holding them there for a few weeks, let them out to tell the tale so NATO won't have the desire to repeat it. As I understand it both parties need to give permission for a third party warship. And german ships are an exeption ? Ukraine could invite US ships if they really want to send nato ships there. digging in its heels. And rightully so. the best proof thst "forced entry " to Kerch Strait is not gonna happen is th at USN didnt even try. Of course morons 'n' doggies like Ukrop leadership can. It's the same as if the VMF demands to be let in the Hudson Strait so its ships can sail into the Hudson Bay. Or in the Naruto Strait to get to the Seto Inland Sea. Submariners are transferred to turbo mode. After the president's instructions to shorten the deadlines for the delivery of nuclear submarines, the Ministry of Defense decided to change the training system for the crews of the newest nuclear missile carriers of the Borey and Yasen projects. Previously, submariners took the boat and already completed training on it. Now the crew will undergo a full course even during the construction and testing of the ship, the military department told Izvestia. According to experts, reducing the time for training crews will help to quickly put new nuclear missile carriers into combat service. The crews of nuclear submarines (NS) almost immediately after enrollment of ships in the fleet will be able to begin the implementation of combat missions, told "Izvestia" in the Main Command of the Navy. For this, the personnel of the submarine cruisers, even before being included in the Navy, will have to work out and pass standards relating to the tasks of organizing service on the boat, preparing for the cruise, sailing, and conducting combat operations. Previously, the implementation of these standards was allocated about a year. According to an accelerated method, the crew of the Prince Vladimir nuclear submarine, which is due to join the fleet this year, is already being trained. During the training, the crew of the submarine must pass a series of stages, said the head of the St. Petersburg submariners club, captain of the first rank Igor Kurdin. “The crew is first formed and knocked together,” Igor Kurdin told Izvestia. - Then the sailors begin work on the study of the ship in training centers in Obninsk or in Sosnovy Bor. Then they are sent to the factory, where they study the structure of the boat, which is still under construction. After that, the crew, together with engineers and designers, participates in mooring, running and state trials, where the most complex elements of maneuvering and the use of rocket and torpedo weapons are worked out. The last stage of training is the development of navigation under the ice with the mandatory use of missile and torpedo weapons. Saw on twitter that it's says Putin ordered 5 new warships for black sea fleet. More grigorovitch ? Or maybe kalibr carrier Karakurt ? MOSCOW, March 19 - RIA News. Submarine forces of the Russian Navy over the next three years will consist of about 80 submarines, taking into account the construction of six submarines of project 636 for the Pacific Fleet, an informed source told RIA Novosti on Tuesday. To date, the submarine forces of the Russian Navy have more than 70 submarines, including the nuclear strategic submarines of the Borey (955) and BDRM (667) projects, multi-purpose projects such as Yasen (885) and Shchuka (971), diesel type "Varshavyanka" (877 and 636) and special purpose type "Sarov" (20120). "Taking into account the construction of a new series of six submarines of project 636 for the Pacific Fleet, the submarine fleet of the Russian Navy will consist of about 80 units by 2023," the agency’s source said. He recalled that now is also considering the possibility of increasing the group of Borey-class atomic strategic rocket carriers from eight to ten. Gorskhov-M I wonder what comes into real figate place? Probably the new corvettes would probably take the place of the old frigates, while drone-boats would probably take the place of old corvettes. I'm thinking drone-boats, with no crew space could be built 50% smaller than conventional corvettes, but with the same armament and could be towed and controlled by bigger ships to give them extra fire-power. Since 2020, USC will take two to three nuclear submarines a year. "The volume of orders, which fall on the Northern Machine-Building Enterprise, is already even higher than what was in the Soviet years. Starting next year, we will take two or three submarines a year," said Rakhmanov, adding about nuclear submarines. drone corvettes or rather missile boats make sense but IMHO still 10-15 years we need to wait until they get operational. As for "corvette- frigate" now 20386 seems to be not the best candidate IMHO bvut i dont see anything else. dino00 wrote: Since 2020, USC will take two to three nuclear submarines a year. But you have to build ships/subs to be in delay. Will be more like 1 Yassen-M + 1 Borei-A a year. Plus 1 Khabarovsk (at least for three years). Hole wrote: But you have to build ships/subs to be in delay. the question is for how long. Rakhmanov in further part of this interview (different article in ria) said that UCK has work orders for more then 12 years ahead. This might mean 12x2,5 so 30 nuclear subs max. Can be 2x10 so only 20 but still impressive. There are 7 Yasens of which 2 lunched already and 6 Boreis to be launch still if Im correct. so 5+6 = 11 + Kahbarovsk = 12. 2-3 per year, then means Huskies or more Yasens on horizon to me. Plus the 6 kilo for pacific fleet. And they upgrading older SSN like akulas and probably oscars. bTW it is planned to build also 12 Ladas , 6 Pacific/6 North Fleets. But AFAIK AIP wont be there. 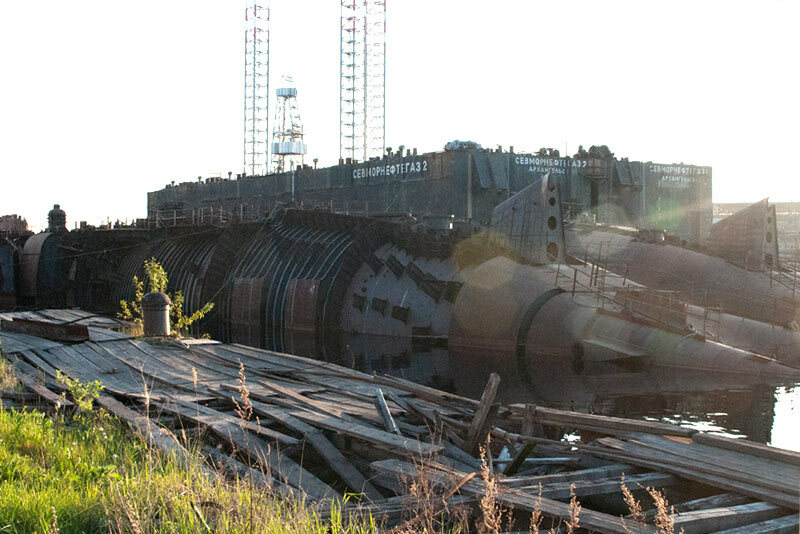 I heard rumor that there are 4 unfinished Oscar-class hulls in Sevmash. unfinished hull + Poseidon = finished carrier?